SUMMARY: Triplet girls separated at birth learn they are descendants of the mythological Gorgon Medusa charged with protecting mankind from mythology's most heinous creatures. REVIEW: As a librarian, I get book recommendations from students and teachers all the time. I really do try to read at least some of them, especially if the recommendation comes from a student whose taste in books is similar to mine. A few weeks ago, a sweet sixth grade girl recommended Sweet Venom to me, saying she really, really loved it. A big Tera Lynn Childs fan, I'd been wanting to read SV for awhile anyway, and my girl's recommendation gave me the push I needed. I really liked this one! I tend to enjoy mythology-influenced stories anyway, and Childs's Forgive My Fins was one of my favorite books on the 2011-2012 Lone Star Reading List. While for me, Sweet Venom lacked the charm of Forgive My Fins, I found it mostly well-paced with a gruesome cast of mythological monsters and a fun premise. I liked the triplet characters of Gretchen, Grace, and Greer, but I do think the three girls' alternating voices were not distinctive enough. If I stopped reading mid-chapter, I would sometimes have to read a several paragraphs before I could tell which girl's story I was reading. Greer, Grace, and Gretchen are very different characters, and I wish their "voices" were more unique to them. The book is well-paced for the most part, but the story really picks up once the third triplet, Greer, is introduced. Greer is hands-down my favorite character, and her inclusion adds an element of sibling-rivalry that I did not expect. Being the oldest in a sisterly trio myself, I enjoyed reading how the girls find each other and learn to get along. I was a little disappointed in the male characters in the story--they are all pretty standard stock. Cute, popular, outgoing, yada yada. I am hoping they develop more fully in the sequel Sweet Shadows. I think the romance is a big part of what I loved about Forgive My Fins and missed in Sweet Venom. Romance is there, but it takes a back-seat to the sisters' story. THE BOTTOM LINE: Romance takes a backseat in this cute story of three sisters battling mythological beasts. Perfect for middle school girls! 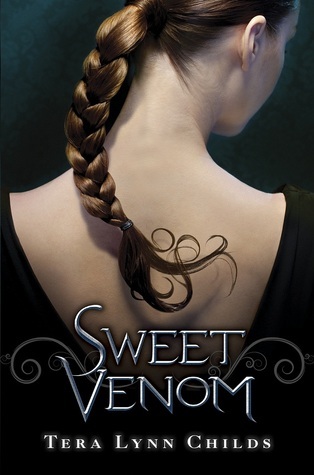 STATUS IN MY LIBRARY: We currently have two copies of Sweet Venom in my library, which I am going to add to next year's Lone Star Plus list for my school.